Dibenzyline (Phenoxybenzamine Hydrochloride) is indicated for the treatment of pheochromocytoma, a certain tumor of the adrenal glands. This is used to control the episodes of high blood pressure and heavy sweating. This medication may also be used to treat peripheral vasospastic conditions. It is a reversible localized or diffuse vasoconstriction of arteries or smaller blood vessels. How does Dibenzyline (Phenoxybenzamine Hydrochloride) work? 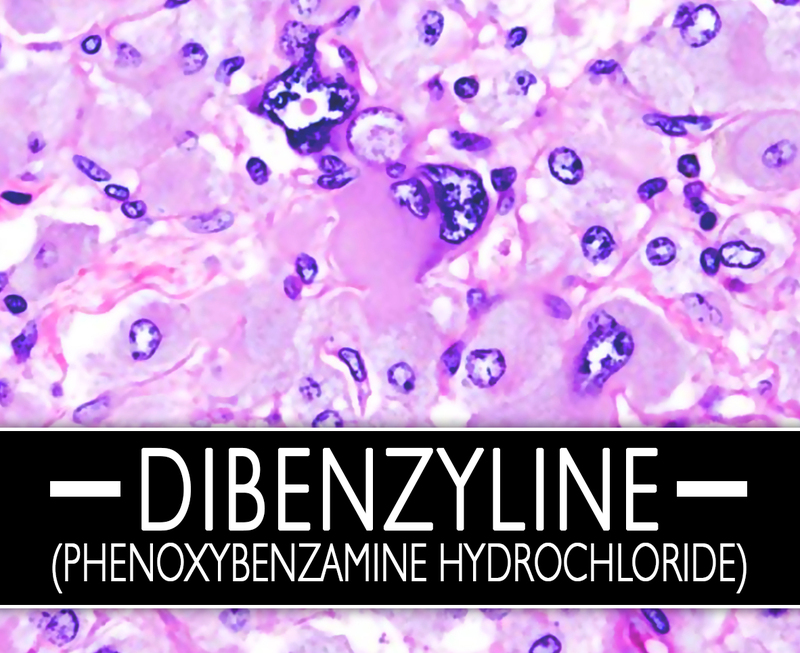 Dibenzyline (Phenoxybenzamine Hydrochloride) produces therapeutic actions by blocking alpha receptors. It leads to muscle relaxation and a widening of the blood vessels so that blood can flow more easily. This widening of the blood vessels results in a lowering of blood pressure. Why use Dibenzyline (Phenoxybenzamine Hydrochloride)? Dibenzyline (Phenoxybenzamine Hydrochloride) has a long duration action which is an alpha-adrenergic antagonist. It has been used to treat hypertension and as a peripheral vasodilator. The Peripheral vasodilator is a prescription to treat conditions that affect the blood vessels in outer parts of the body. This is available as a capsule with 10mg of Phenoxybenzamine Hydrochloride for oral administration. How to use Dibenzyline (Phenoxybenzamine Hydrochloride)? Take this medication exactly as it is prescribed. This medicine is to be taken by mouth with a full glass of water. You may take it with or without food. It is usually taken 2 to 3 times a day. Take it at the same time each day. The dosage depends on your medical condition and response to the drug. You should not stop or change the dose without the prescription of your doctor. Your condition may become worse if you will suddenly stop the medication. Let your doctor know if your condition worsens like your routine blood pressure increases. What are the side-effects of Dibenzyline (Phenoxybenzamine Hydrochloride)? Before taking this drug, tell your doctor if you have any medical history especially of heart disease, blood vessel disease, or kidney disease. Tell also to your doctor if you have any current medications such as vitamins or herbal supplements. Avoid driving or using any machinery. It may need your full alertness. This drug may make you feel dizzy or drowsy. This medication should only be used when clearly needed during pregnancy. Keep this drug at room temperature away from moisture and heat.